Samples from the cosine variant of the bivariate von Mises distribution. The green points are sampled from a distribution with high concentration and high correlation ( , ), the blue points are sampled from a distribution with high concentration and negative correlation ( , ), and the red points are sampled from a distribution with low concentration and no correlation ( ). 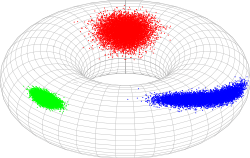 In probability theory and statistics, the bivariate von Mises distribution is a probability distribution describing values on a torus. It may be thought of as an analogue on the torus of the bivariate normal distribution. The distribution belongs to the field of directional statistics. The general bivariate von Mises distribution was first proposed by Kanti Mardia in 1975. One of its variants is today used in the field of bioinformatics to formulate a probabilistic model of protein structure in atomic detail. where and are the means for and , and their concentration and the matrix is related to their correlation. Two commonly used variants of the bivariate von Mises distribution are the sine and cosine variant. where and are the means for and , and their concentration and is related to their correlation. is the normalization constant. This distribution with =0 has been used for kernel density estimates of the distribution of the protein dihedral angles and . where the parameters have the same interpretation. 1 2 Mardia, Kanti (1975). "Statistics of directional data". J. Roy. Statist. Soc. B. 37: 349–393. doi:10.2307/2984782 (inactive 2016-03-06). JSTOR 2984782. ↑ Mardia, K. V.; Frellsen, J. (2012). "Statistics of Bivariate von Mises Distributions". Bayesian Methods in Structural Bioinformatics. Statistics for Biology and Health. p. 159. doi:10.1007/978-3-642-27225-7_6. ISBN 978-3-642-27224-0. 1 2 Boomsma, W.; Mardia, K. V.; Taylor, C. C.; Ferkinghoff-Borg, J.; Krogh, A.; Hamelryck, T. (2008). "A generative, probabilistic model of local protein structure". Proceedings of the National Academy of Sciences. 105 (26): 8932–7. doi:10.1073/pnas.0801715105. PMC 2440424 . PMID 18579771. 1 2 Shapovalov MV, Dunbrack, RL (2011). "A smoothed backbone-dependent rotamer library for proteins derived from adaptive kernel density estimates and regressions". Structure (Cell Press). 19 (6): 844–858. doi:10.1016/j.str.2011.03.019. PMC 3118414 . PMID 21645855. ↑ Singh, H. (2002). "Probabilistic model for two dependent circular variables". Biometrika. 89 (3): 719–723. doi:10.1093/biomet/89.3.719.